In January 2012 I had just started the final semester of my Master’s Degree. I had been in University for five years at that stage, having studied a B.A. in English and History and now about to complete an M.A. in European History. Obviously, this was the time that I was seriously considering what my next move would be. Making the decision to book a TEFL course with i-to-i was not one I made for the sake of it. I knew I wanted to travel and I knew that this would be a useful qualification to have. As my Masters was in European History I was required to specialise in a specific topic and I had settled on Spanish history many months previous to that. That was where my interest in Spain began. I had been looking on tefl.com a lot as the months rolled by, and time and time again came across the same advertisement for the Spainwise TEFL Jobs Fair. Eventually I actually followed the link out of curiosity and straight away decided that I was going to go. I arrived in Córdoba having just submitted my thesis and really wanted to make an impression. The great thing about the Spainwise Jobs Fair is that you have the opportunity to speak to so many different schools. In the space of a few hours you get the chance to do so many interviews, which, for a newly-qualified teacher like me, was an amazing opportunity. The fair itself was great. There was so much information and I even found that speaking to other teachers was helpful as they had experience of teaching in Spain and were able to offer some useful tips. I had one interview set up before I got to the fair (with TECS Summer Camps) and within ten minutes of having registered I had a second interview organised with Academia Blue Door in Córdoba. Following an amazing summer in TECS, tiring but amazing nonetheless, I arrived in Córdoba once again. Now, months later, I have to admit I feel like I’m at home. Having taught for the summer in TECS I was really well-prepared for what was to come and, although an academy is totally different from a Summer Camp experience, there’s a lot to be said for having a few weeks teaching under your belt. Working in Blue Door is really great. There is a brilliant team of teachers and management who are always willing to help and there is such an emphasis on attitude here. Again if I have learnt anything from Spainwise it’s that qualifications are great and always help but your attitude can be the thing that just makes you that little bit more memorable than someone else. In saying all of that it’s also important to note that unless you’re prepared to work hard this is not a profession for you. 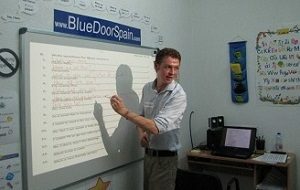 Blue Door is a Cambridge and Trinity exam school, as are many of the other schools that participate in Spainwise, and, therefore, students here are counting on teachers to be well-organised, prepared and also to know their stuff. In summary, I think coming to Spainwise was the best trip I’ve ever made. It was so well-organised from the C.V. forwarding service to the interviewing process on the day to the feedback given afterwards. I couldn’t have imagined having such a fantastic opportunity to meet face to face with so many prospective employers, especially as a newly-qualified teacher but Spainwise offers just that opportunity. I regret nothing and would highly recommend it to anyone who wants to teach in Spain. Find out about the Spainwise TEFL Job Fairs here.